Robert CROSS I (1613- 1693 ) was a farmer at Ipswich, Mass. and the first Cross to arrive on US soil. He was Alex’s 10th Great Grandfather, one of 2,048 in this generation of the Shaw line. 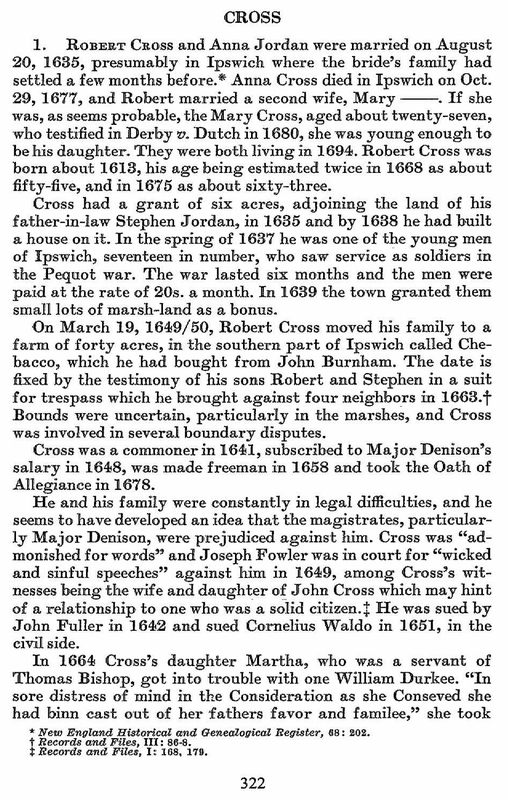 Robert Cross was born in 26 Jun 1613 in Charlinch, Somerset, England His parents were Thomas CROSS and Rachel DISLING. He sailed from Ipswich, England to Ipswich, Massachusetts on the “John & Mary” in 1634. He married Anna JORDAN on 20 Aug 1635 presumably in Ipswich where the bride’s family had settled a few months before. After Anna died, he married a second wife, Mary [____]. If she was, as seems probable, the Mary Cross, aged about twenty-seven, who testified in Derby v. Dutch in 1680, she was young enough to be his daughter. Robert died 8 Feb 1692/93 in Ipswich, Mass. Anna Jordan was born in 1617 in Wherstead, Suffolk, England. Her parents were Stephen JORDAN and Susannah WOLTERTON. Anna died 29 October 1669 in Ipswich, Essex, Mass. 3 Jul 1661 Beverly, Essex, Mass. The Crosses of Bristol trace their ancestry to Charlenge, now Charlinch, Somersetshire, England. The name appears in the Domesday Book of William the Conqueror, also in the wars of the Crusades. Sir Robert Cross, of Charlenge, was knighted by Queen Elizabeth, in 1602, or heroism, as admiral, against the Spanish Armada and at Cadiz. He died without issue. His coat of arms was brought to this country by Gen. Ralph Cross, of Revolutionary fame. From it, it may be seen that the family sprang from Norman stock and belonged to the landed gentry of England. Closely related to Sir Robert were Robert and John who, in 1637 sailed from Ipswich, England, to Ipswich, Massachusetts. Robert settled in in Newburyport, Mass. John settled in Methuen, Mass., where eight generations have lived in a house still standing. Sir Renulf Cotgreave, Lord of Hargrave Tarvin and Hattenhall in Country of Palatine and Chester, in reign of Henry IV and Henry V (1399-1422) m. Elinor, daughter of Francis Jamville de Mollington. Elinor Cotgreave, m Sir William Crosse de Charlinge, County of Somerset and Sutton, Cheshire. William Crosse, Esq. de Charlinge and Sutton; m. Isabelle, daughter of Robert de Holme. Lord de Franmure in County of Palatine and Chester. John Crosse, Esq. of Charlinge, and Sutton; m Constance, daughter of William Botelar or Butler, Esq. of Warrington in Country of Lancaster. John Crosse, Esq. de Charlinge and Sutton; m. Angard, daughter of Matthew-Ellis de Vrierleigh near Chester. 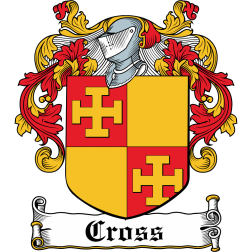 Robert’s father Thomas Cross was born 25 Jul 1580. He married Rachel Disling on 29 Jun 1603 in Durham England. Rachel was born around 1584 in England. By 1638 – Robert had built a house on it. Spring 1637- Robert was one of the young men of Ipswich, seventeen in number, who saw service as soldiers in the Pequot war. The war lasted six months and the men were paid at the rate of 20s. a month. 1639 – The town granted them small lots of marsh-land as a bonus. 19 Mar 1649/50, Robert moved his family to a farm of forty acres, in the southern part of Ipswich called Chebacco, which he had bought from John Burnham. The date is fixed by the testimony of his sons Robert and Stephen in a suit for trespass which he brought against four neighbors in 1663. Bounds were uncertain, particularly in the marshes, and Cross was involved in several boundary disputes. 1658 – Robert made freeman in 1658 and took the Oath of Allegiance in 1678. Robert and his family were constantly in legal difficulties, and he seems to have developed an idea that the magistrates, particularly Major Denison, were prejudiced against him. 1649 – Robert was “admonished for words” and Joseph Fowler was in court for “wicked and sinful speeches” against him, among Robert’s witnesses being the wife and daughter of John Cross which may hint of a relationship to one who was a solid citizen. 1651 – Robert sued Cornelius Waldo, in civil court. 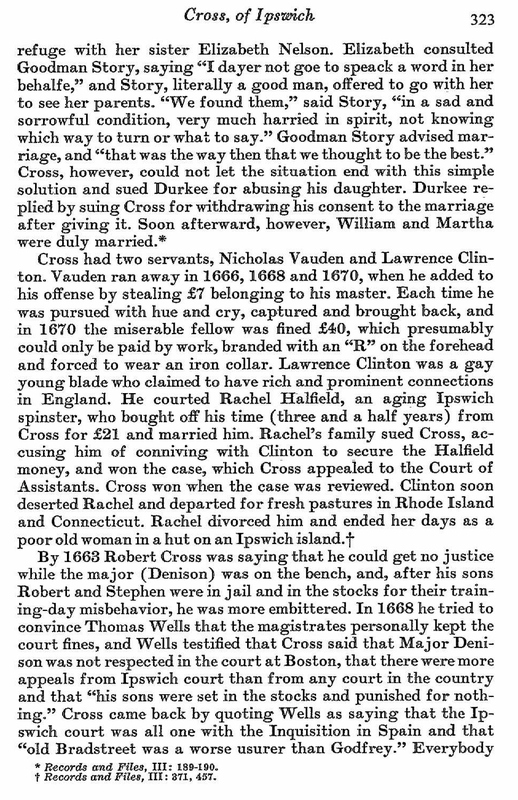 Cross had two servants, Nicholar Vauden and Lawrence Clinton. Vauden ran away in 1666, 1668 and 1670, when he added to his offense by stealing seven pounds belonging to his master. Each time he was pursued with hue and cry, captured and brought back, and in 1670 the miserable fellow was fined £40, which presumably could only be paid by work, branded with an “R” on the forehead and forced to wear an iron collar. Lawrence Clinton was a gay young blade who claimed to have rich and prominent connections in England. He courted Rachel Halfield, an aging Ipswich spinster, who bought him off his time (three and a half years) from Cross for £21 and married him. Rachel’s family sued Cross, accusing him of conniving with Clinton to secure the Halfield money, and won the case, which Cross appealed to the Court of Assistants. Cross won when the case was reviewed. Clinton soon deserted Rachel and departed for fresh pastures in Rhode Island and Connecticut. Rachel divorced him and ended her days as a poor old woman in a hut on an Ipswich island. By 1663 Robert Cross was saying that he could get no justice while the major (Denison) was on the bench, and, after his sons Robert and Stephen were in jail and in the stocks for their training-day misbehavior, he was more embittered. 1668 – Robert tried to convince Thomas Wells that the magistrates personally kept the court fines, and Wells testified that Cross said that Major Denison was not respected in the court at Boston, that there were more appeals from Ipswich court than from any court in the country and that “his sons were set in stocks and punished for nothing”. Cross came back by quoting Wells as saying that the Ipswich court was all one with the Inquisition in Spain and that “old Bradstreet was a worse usurer than Godfrey.” Everybody was fined and bound to good behavior. Cross gained one point when he sued Wells for slander for saying that Cross was a “cheating knave,” the court forcing Wells to make a public acknowledgment to clear Cross’s good name. Mary’s husband Ephraim Herrick was born 11 Feb 1638 in Salem, Essex, Mass. His parents were Henry Herrick and Editha Laskin. Ephraim died 18 Sep 1693 in Beverly, Essex, Mass. Ephraim’s father had come to Salem, Massachusetts, in about 1629 with a large group of English settlers, probably including Francis Higginson, minister of the Salem Church in 1629-1630. Ephraim’s father was a landowner and a farmer; it is assumed that Ephraim did the same thing. Ephraim took the Oath of a Freeman in 1668, at the age of 30. The Herrick family was destined to become a significant part of the Salem Witch Trials of 1692. At the time, Ephraim was 54 years old and Mary was 52. Their children ranged in age from twenty-years-old to nine. Their oldest son, John, was married to Bethia Solart, whose sister, Sarah Solart Poole Good, became one of the accused witches. Having Bethia’s sister accused of being a witch must have sent chills through all of the Herricks. Though not blood related to Sarah, she was an in-law, and they must have been concerned and possibly frightened: Who would be next? Ephraim’s brothers were also heavily involved in the trials. His older brother, Zachariah, had refused to give aid to Sarah when she was down-and-out and in need of a home and food for her children. Another brother, Henry, was a member of the jury and would eventually sign the apology for their decisions. Finally, Ephraim’s brother, Joseph, was the local constable and arrested most of the people charged with witchcraft. Four years after the last of the trials, the jury finally realized that they had been had. The following is the text of their signed “Confession of Error” (January 14, 1696), published after Ephraim’s death so he never knew of his brother’s apology. Deacon William FISKE (1643 – 1728), Joseph BATCHELLER’s son John (1638 – 1698) and Daniel WARNER’s son-in-law John Dane (1645 – 1707) were also on the Jury during the witchcraft cases in Salem. See my post Witch Trials – Jury for the text of the apology. Ephraim Herrick died on 18 Sep 1693 in Beverly, Essex, Massachusetts. He was 55 years old and he and Mary had been married for 32 years. The cause of his death is unknown, but one can certainly speculate that the stresses of the trials may have placed a heavy burden on Ephraim’s heart. Shortly after his death, his son, John, and daughter-in-law, Bethia, would leave the area and try to start a new life in New York. Mary lived for another seventeen years, apparently never leaving the area, and dying in Salem at the age of 70 in the year 1710. Robert’s wife Martha Treadwell was born 16 Mar 1641/42 Essex, Mass. Her parents were Thomas Treadwell and Mary Taylor. Martha died 3 Mar 1737/38 at the age of 95. In 1667, after a day spent in military training, Robert Cross Jr, his cousin John Andrews, jr., and a few other young men, probably under the influence of too much “sack,” or aqua-vitae, committed what the court with some justice termed a “barbarous and inhuman act.” They opened the grave of the Indian Sagamore of Agawam, who had been a constant friend of the first settlers of Ipswich, scattered his bones and carried his skull on a pole. Cross was apparently the ring-leader, and he was sentenced to jail until the next lecture day when he was to sit in the stocks for an hour after meeting, then to be taken back to prison to remain until he had paid a fine of L6: 13:4. After his release he was bound to good behavior and obliged to bury the sagamore’s bones and erect a cover of stones two feet high on the grave. The case naturally caused a great sensation, the mildest comment being that the fines and imprisonment punished the culprits’ parents, who had to find the money and replace their labor, more than it did them. Drink was Robert Cross’s curse. He owned that he drank excessively in 1670, he was “much in drink” in Gloucester in September, 1671, again in Salem in 1673, and was fined for breach of the peace in 1677. Cross seems to have been in the coasting trade, dealing in lumber. In 1673 he had sold 2000 feet of sawed boards to Ezekiel Needham of Lynn and sued for payment of L3 in goods and a pair of shoes, winning the case. His brother Stephen CROSS, who testified against him, had guaranteed Needham against loss and damage and acknowledged a judgment which Needham obtained in 1676. Robert won another case against Hugh March in 1677, receiving payment of 16,000 feet of merchantable pine boards which he had twice gone to Exeter to fetch. John Lee sued him in 1680 for not delivering 3,160 feet of pine boards which he was to obtain at Lamperill river and deliver in Boston. In 1680 Cross leased land on “the little neck” and engaged in a continuous feud with the fishermen who were accustomed to use the beach there. There also, in 1686, he broke open the hut of an old shepherd, Capt. John Ayres, who kept the flock on the neck, and brutally assaulted him. 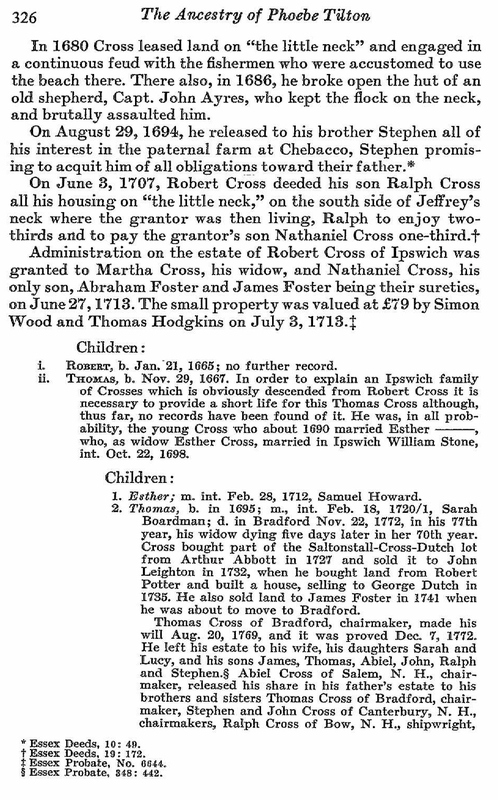 Administration on the estate of Robert Cross of Ipswich was granted to Martha Cross, his widow, and Nathaniel Cross, his only son, Abraham Foster and James Foster being their sureties, on June 27, 1713. The small property was valued at L79 by Simon Wood and Thomas Hodgkins on July 3, 1713. (Essex Probate, No.6644. William arrived on Nov 9, 1663 as the indentured servant of Thomas Bishop, having been in the Barbadoes, probably as a slave of Cromwells. Martha was probably employed in the household of Thomas Bishop. They married in Ipswich, Mass. on Dec. 20, 1664 after Robert Cross sued William for abusing his daughter and William countersued Robert for withdrawing his consent to marriage after giving it. Two weeks later, their first child John was born. Son Thomas was born in 1666, daughter Martha in 1668, and son William in 1672. Elizabeth born about 1670, Mercy, Anna born about 1680, Mary, Jane, and Henry? were also probably children of William and Martha. Since William would not renounce his Catholicism, he could not own land. Almost all Durkees in the United States and Canada are descended from the three sons: John, Thomas, and William. One exception are a small group in Wisconsin descended from Herman and William Durkey who arrived there about 1870 from Germany. Another exception spell their name Durgy and descend from John Durgy who married Hannah (Conger) in 1784 in New Fairfield, Conn.
1664 – Martha got into trouble with one William Durkee. “In sore distress of mind in the Consideration as she Conseved she had binn cast out of her fathers favor and familee,” she took refuge with her sister Elizabeth Nelson. Elizabeth consulted Goodman Story, saying ” I dayer not goe to speack a word in her behalfe”, and Story, literally a good man, offered to go with her to see her parents. “We found them,” said Story, “in a sad and sorrowful condition, very much harried in spirit, not knowing which way to turn or what to say.” Goodman Story advised marriage, and “that was the way then that we thought to be the best.” Cross, however, could not let the situation end with this simple solution and sued Durkee for abusing his daughter. Durkee replied by suing Cross for withdrawing his consent to the marriage after giving it. Soon afterward, however, William and Martha were duly married. Elizabeth’s husband Deacon Seth Story was born in 1645 in Ipswich, Mass. His parents were William STORY and Sarah FOSTER. Seth died 9 Oct 1732 in Ipswich. Seth became a deacon and was quite prominent in Ipswich Senior Deacon, 2nd Church of Chebacco. Chebacco was incorporated as Essex in 1819. The name Chebacco is Agawam in origin and refers to a large lake whose waters extend into neighboring Hamilton. Ann’s second husband Ephraim Fellows was born Mar 1641 in Ipswich, Essex, Mass. His parents were William Fellows and Mary Ayer. His aunt was Sarah AYRES wife of William LAMSON. 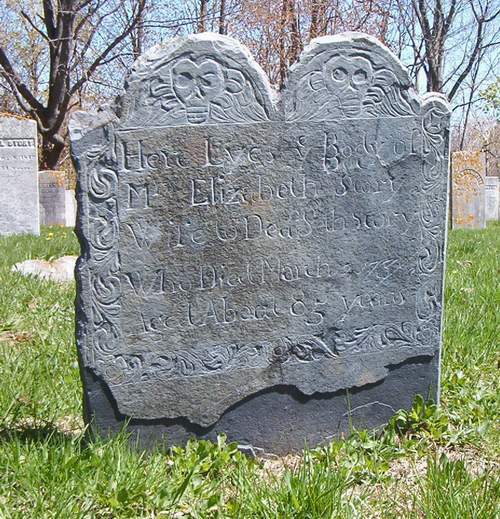 Ephraim died 1713 in Plainfield, Windham, CT.
and Susanna Birchard.Mary died 8 Jan 1739 in Mansfield City, Tolland, CT.
Peter Cross was born in Ipswich, MA and is given credit for being one of the pioneer settlers in Windham, CT where some of his children were born. In 1693, it was decided that the dividing line between the settlers of Hartford and Norwich should be the Willimantic River, the Norwich people holding on the east of it and the Hartford people holding on the West of it. A highway was ordered through Peter Cross’s division, extending from the pond to the Willimantic river near the falls. Peter was given 12 acres below the falls in compensation for the land taken up by the highway. 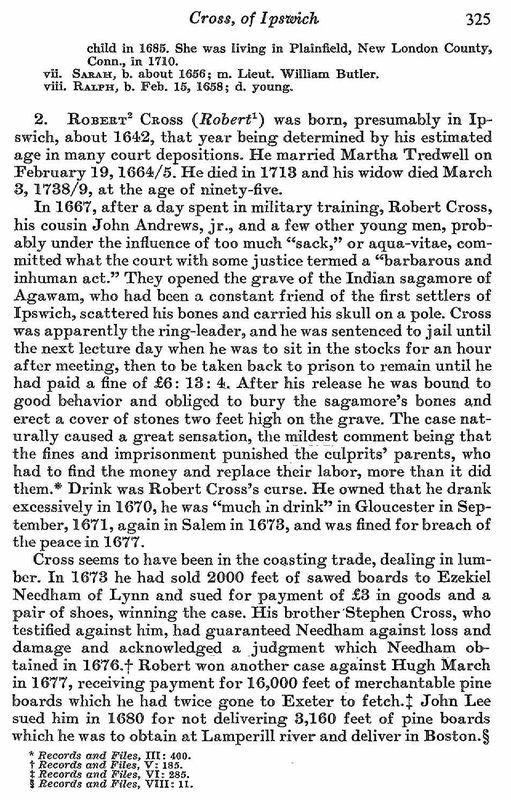 In Oct. 1696, Jonathan Gennings and Peter Cross, administrators to the state of Robert Wade (their brother-in-law) of Norwich, informed the courts that Robert Wade died in a lot of debt leaving his family in want. They said it would be necessary to sell some of Robert’s land to pay off his debts and to relieve his family. Power was granted them to sell the land with the consent of Lt John Fitch and Ens Jonathan Crane (the overseers)..
George’s wife Martha Bonfield was born about 1660 in Essex, Mass. Her parents were George Bonfield and Rebecca Bradstreet. Sarah’s husband Lt. William Butler was born 1653 in Essex, Mass. His parents were William Butler and Sarah [__?__]. William died 2 Aug 1730 in Ipswich, Essex, Mass. William Butler, Jan. 29, 1711, gives to his son Ralph “one half of the house I now live in—that is, the northwest end, the old end that father Cross lived in–with two acres of tillage, etc. This farm was in Chebacco (the part of Ipswich now Essex) and had been bought by William Butler in 195 and 199 of Capt. 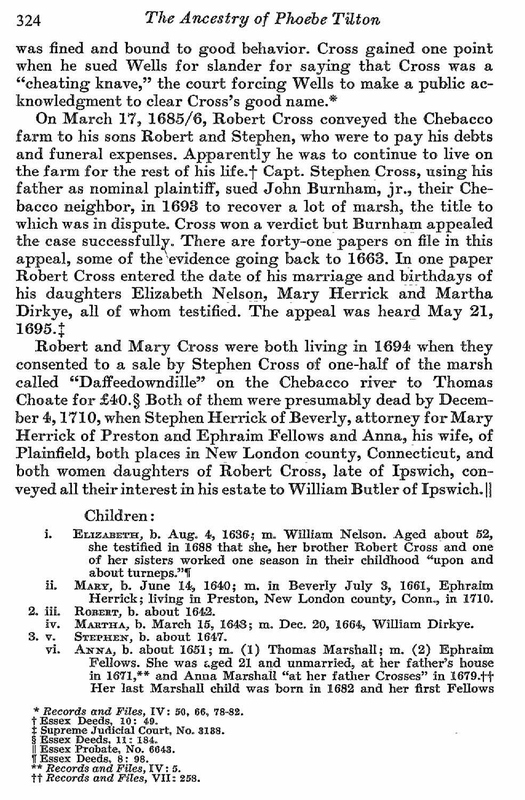 Stephen Cross and Robert Cross, Jr., sons of Robert Cross, Sr. (Essex Deeds, Vol. 10, p. 163; vol. 12, p. 53). It is in the deed of Capt. 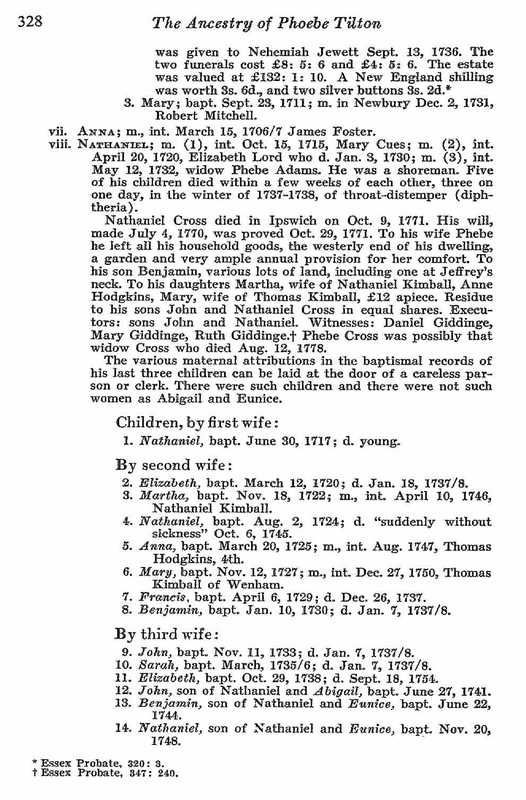 Stephen Cross, June 15, 199, that is found the first mention of William Butler as lieutenant; in other deeds he is called “senior,” “farmer” and “yeoman,” William’s wife Sarah died before July 21, 1703, when he married Mary Ingalls, and he married again (int. pub. Oct. 3, 1713) Abigail Metcalf. She survived him, marrying, June 1, 1731, Lieut. Simon Wood, and dying Oct. 1, 1732, aged 67 years, which makes her date of birth 1665. When they married in 1705, Ralph was 47 years old and Mary was 20. 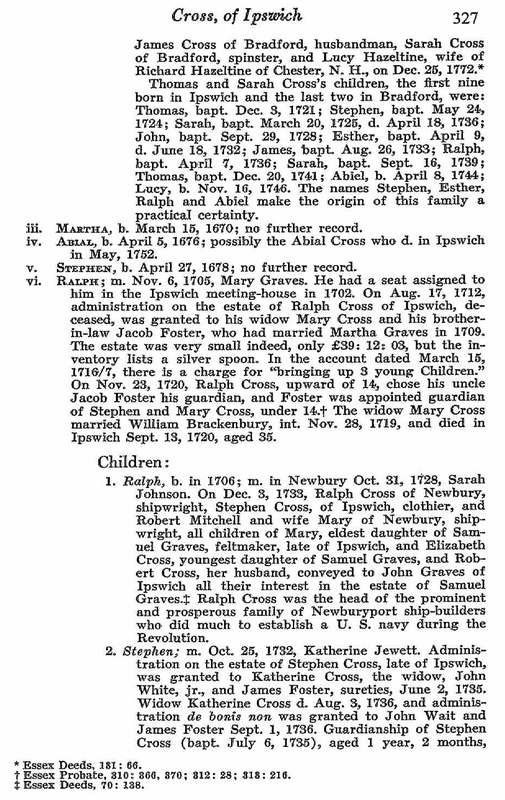 Ralph’s nephew Robert CROSS II married Mary’s youngest sister Elizabeth GRAVES 26 Sep 1719. This entry was posted in 12th Generation, Be Fruitful and Multiply, Immigrant - England, Line - Shaw, Veteran and tagged Chebacco, Ipswich - Pioneer. Bookmark the permalink.